Mediapolis provides teleprompter services for people that need to talk directly to the camera, but need help with visual cues. With a teleprompter, the person speaking looks directly at the camera and visually sees scrolling text of a script or speech. This makes it ideal for instructional videos and executive presentations. The speaker saves time because there is no memorization. Umms and ahhs are eliminated because the speaker is reading the text. A teleprompter enhances the production value by helping your on-camera talent look natural and professional because they feel confident and comfortable, especially when the talent isn’t the subject matter expert. The personal connection with the viewer is achieved… just what you want for a professional presentation. The less familiar your presenter is with the script, the more you force the teleprompter to jeopardize a natural delivery. The intended use of a teleprompter is to prompt, but if your presenter fails to properly rehearse then the natural delivery and connection with your audience is lost. Using cue cards is similar to using a teleprompter. The difference is that cue cards are held up next to the camera. Cue cards cause the smallest shift in eye-line that can be quite noticeable to the viewer. A teleprompter allows the person to look directly into the lens of the camera. The teleprompter operator scrolls the text up the screen at the same pace of the speaker. For a more convincing presentation, use a teleprompter. Our teleprompter has a 15″ LCD screen with beam splitter glass that will fit any size camera. The beam splitter glass allows the camera to see the subject, yet is reflective enough so words can be seen on the glass. Our system is available for half day or full day rentals with an operator. The system includes the teleprompter, software and a laptop computer. 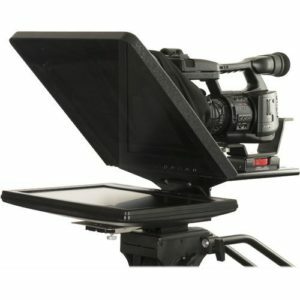 We offer affordable teleprompter services for both video production and live events. We look forward to working with you as your teleprompting partner.